Today, the Midwest Collegiate League named Jack Kraus the MCL Player of the Week as the regular season comes to a close. The catcher/first basemen from Wisconsin-Milwaukee joins Jeremiah Lebron as the only two Generals to earn Player of the Week honors. 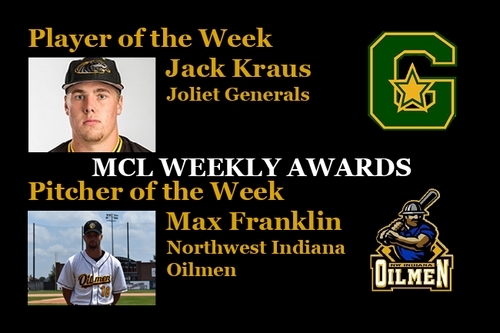 Alongside Kraus, Max Franklin of Northwest Indiana was named the MCL Pitcher of the Week. "Kraus played a key role as Joliet (17-23) made a late playoff push, winning three consecutive games to pull within striking distance of the Bloomington Bobcats for the final playoff spot entering the last day of the regular season. However, Joliet dropped the finale 4-1 to Southland and saw its season end. Kraus had hits in all five games he played this week including four multi-hit outputs. He went 11-for-20 (.550 AVG) while racking up seven doubles. He entered the week with four doubles in 25 games this season before seven of his 11 hits over the five-game span went for two bases." For the summer, Kraus finished tied for the team-high in batting average (.351 with Josh Nowak) and hits (40 with Lebron). He also led the Generals with 11 doubles.